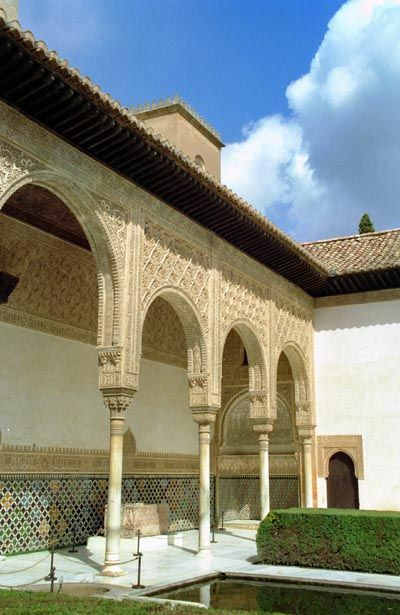 The Alhambra is not only the most important, but also the best conserved Arabian palace of its epoch. The name Alhambra means "the red one" and refers to the color of the mountain on which it is built. Muhammed Al-Ahmar, began with the restoration of the old fortress. His work was completed by his son Muhammed II, whose immediate successors continued with the repairs. The construction of the palaces (called Casa Real Vieja, "old Royal House or Palace") dates back to the 14th century and is the work of two great kings: Yusuf I and Muhammed V.
Find more Alhambra images in the gallery of Photorena.